Pictured above: Ryan Menke dashes through lane, laying it up and in, for two of a game high 17 points. Montgomery, Mo. –Prior to the start of Friday night's game, there was a moment of silence for the family of 16-year-old Natalie Nicole Knudsen, the students, faculty, and staff of Hermann High School. Knudsen was tragically killed in a car accident Wed., Dec. 7. Ryan Menke had his best all around game of the season, scoring a game high 17 points and dishing out 5 assists, Lance Gerlemann added 12 points and 7 boards to beat Montgomery County 35-42. The Shamrocks enjoyed their largest lead of the game midway through the fourth quarter, (24-35) when Montgomery decided to make things interesting. The Wildcats went on a 7-0 run, capped off with Taylor Deves knocking down a three after Austin Madden missed the frontend of a one and one with 2:17 left. New Haven put a screeching halt to Montgomery’s 7-0 run, regaining their poise and running a min off the clock, forcing the Wildcats to foul. New Haven hit 7-9 free throws down the stretch chalking up their fifth win of the season. Pictured right: Lance Gerlemann goes up strong, scoring two if his 12 points. New Haven improves to 4-1 on the year after Friday night’s win. The Rocks defense has made it hard for teams to score, holding teams to an average of 33 ppg, and only allowing Bowling Green in their season opener to score more than 40 points. 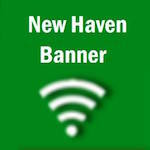 New Haven next will play host to the Sullivan Eagles in their home opener and conference game on Tues., Dec. 13 with the JV tip off at 6 p.m.
QuickNewHavenNews will be broadcasting live; do not miss a second of the action. We will have a pregame show beginning at 7:10 p.m.
Pregame show will feature comments from Coach Steinhoff, updates on area Four Rivers Conference Teams, and a look into that night’s game.